Arsenal will reportedly have to fend off interest from Inter in midfield ace Granit Xhaka this summer, as he’s said to be on their transfer shortlist. The 26-year-old has made 125 appearances for the Gunners since he joined them in 2016, establishing himself as a key figure in midfield after overcoming a difficult start to life in England. Coupled with the fact that Aaron Ramsey’s exit has already been confirmed as he prepares to join Juventus on a free transfer this summer, Unai Emery surely can’t afford to lose any more midfielders at a time when he must prioritise adding more quality and depth in that department. According to Calciomercato though, it seems as though they could come under pressure to keep Xhaka at the Emirates, as Inter have added the Swiss international to their list of summer transfer targets with the likes of Luka Modric and Ivan Rakitic previously prioritised. It’s suggested that Nicolo Barella and Tanguy Ndombele remain of interest to the Nerazzurri, but now Xhaka has emerged as an option too. However, importantly it’s added that with Arsenal unlikely to accept anything less than the €45m that they spent on him, it could scupper any Inter hopes of a deal. 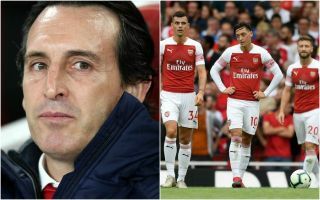 Nevertheless, it will remain a concern for Arsenal fans as Inter are tipped to launch a bid if there is a chance of a deal being done, which could leave the north London outfit severely short-handed before making their own moves on the market. In truth though, it has to be questioned as to why Xhaka would wish to swap Arsenal for Inter, with both clubs in similar situations currently as they continue to battle for a top-four finish in the Premier League and Serie A respectively. Having settled in England and with Emery seemingly taking Arsenal in the right direction, it’s arguably a good time to be at the club.